Kicking the competition: First year Ryan Houseman plays against Middlebury on Saturday. The team came away with a 3-1 win after Moctar Niang ’19 scored off of two headers. The team then went on the win against University of Southern Maine 1-0 in overtime on Sunday. 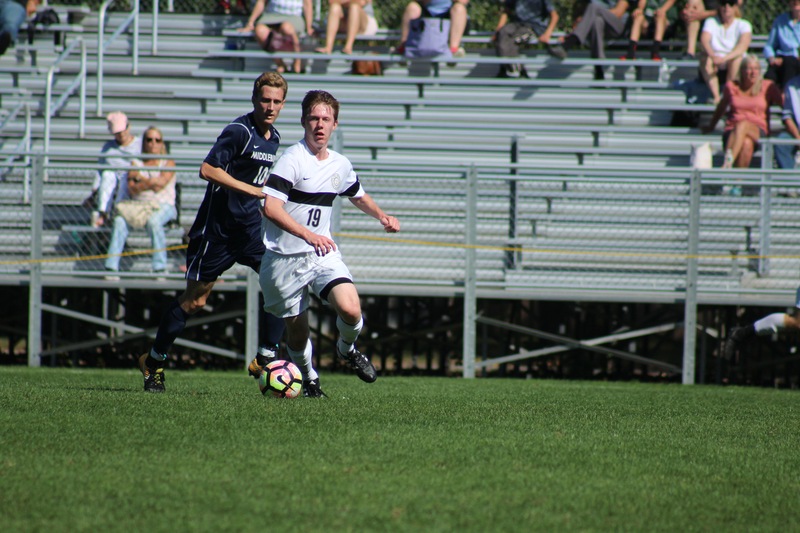 The Bowdoin men’s soccer team (6-2, NESCAC 3-1) had a successful weekend, earning back-to-back wins against Middlebury (5-2, NESCAC 2-2) and the University of Southern Maine (4-5). In Saturday’s game against Middlebury, Moctar Niang ’19 scored two header goals. Niang’s aggressive play and presence on the field aided the team to a 3-1 win. The Middlebury game was expected to be a challenge due to the parallels between the two teams. “We knew it would be a battle, for all intents and purposes. We are very similar in talent [and] very similar in athleticism, so it could go either way. We are pretty familiar with them as a team, so we felt like anything was possible,” said Wiercinski. Despite the similarities between the teams and the expected challenge, the Polar Bears’ team dynamic and energy contributed to the resulting victory. “I felt like the guys were excited for a good challenge, and they really came out and fired on all cylinders and played really well [and] with a lot of energy and a lot of discipline, so I think scoring three goals was a happy surprise,” said Wiercinski. “We haven’t been able to score goals at that rate thus far this year, but I think we put them under a lot of pressure, and when you do that, usually goals come from it. So we were ecstatic with the way we played and also [with] the way [the game] finished up,” added Wiercinski. Captain Sam Ward ’18 also attributes the coherent team dynamic to the players’ positive energy both on and off the field. “In my four years I have never had a more enjoyable game. Everyone, from guys who play 90 minutes to the guys who didn’t play at all, [was] there cheering on the sidelines,” he said. 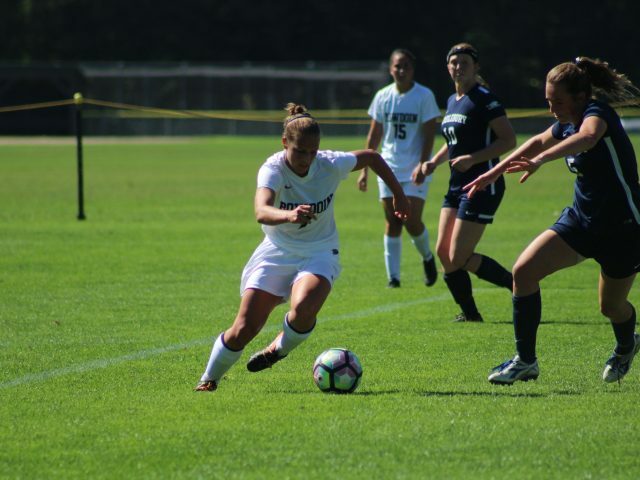 After the significant win over Middlebury on Saturday, Sunday’s game against the University of Southern Maine posed a different kind of challenge. The team again ended the game victoriously, but it was far from straightforward. The team came out with a 1-0 win in overtime, despite having an advantage in total shots. The Polar Bears shot 32 times, while the Huskies shot only once. “[There was an] inability to execute from a technical standpoint. We had a lot of chances. We had a lot of shots…so it’s really small margins of error,” said Wiercinski. Despite their inability to score, Ward believes that the team played a good game. After the back-to-back wins, the team had a much-deserved break this past week. During this time, the team was hoping to secure valuable practice time in order to improve its skills before its game against Thomas College on Monday, October 2. “Hopefully we can get a lot more healthy and we can work on our fitness, because we’ve had a busy couple of weeks recently, but we need to get a little more endurance and we need to score more goals,” said Wiercinski. Senior captain Wilson MacMillan stressed the importance of the team’s cohesive dynamic to strengthening its game performance.